An excerpt from the most recent book by Rolf Gates, one of modern yoga’s leading voices. Rolf Gates is an author and yoga teacher, and Wanderlust festival presenter. 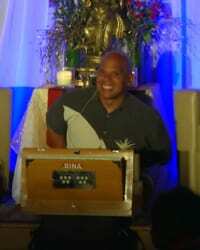 His first book, Meditations from the Mat (2002) was received to critical acclaim. His long-awaited second book, Meditations on Intention and Being was released in December, 2015. The following is an excerpt, reprinted by permission Anchor Books, division of Penguin Random House LLC. All rights reserved. Meditations from the Mat came to me as I was walking home after teaching a yoga class. It was a beautiful morning; the sky was mostly blue, the leaves a vibrant blend of orange, red, and brown. A student stopped me on the street to say that I should write a book. She told me that she was a writer and editor and that over the weekend it had come to her that I should turn the stories I tell in class into a book. Her name is Katrina Kenison, and I will be forever in her debt. Talking that day on a Cambridge sidewalk, Katrina and I were in the midst of something new and beautiful, the widespread adoption of yoga poses as a means for achieving health and wellness. What Katrina appreciated was my use of stories to link the physical practice of the poses to the spiritual practice encompassed by yoga’s eight-limbed path. Meditations from the Mat was intended to accomplish the same thing for students who would never have a chance to practice with me. As I sat down to write, I envisioned people finding something special in a yoga class at the gym or at a yoga studio and wondering how they could take that experience off their mat and into their world. It was a book about starting out and starting over, and as such it has had relevance far beyond yoga. People have written to me about how they have used Meditations from the Mat to help them through divorce, disease, and addiction. That I have been a part of people’s lives in this way means more to me than I could possibly put into words. In the years since I wrote Meditations from the Mat, I’ve traveled around the world, teaching and meeting with thousands of people interested in yoga. Listening to the ever-changing needs of my students and to my own evolving understanding, it has become clear to me that the initial phase in the adoption of yoga by the mainstream, in which it was primarily a physical practice, is passing, and that more and more people are looking for something deeper. My sense is that students are ready to apply the full spectrum of the practice to their daily lives—but they need help. How do we change? How do we live well and love well if it means responding with wisdom and compassion in moments when we have always reacted with fear and anger? How do we turn the purity of our heart’s intention into an authentic way of being? For me, the answer to these questions is discovered when someone learns to enact and embody the teachings of Patanjali’s Yoga Sutras—a series of lessons on the nature of the human condition, human potential, and how that potential can be realized that organize the essence of all spiritual practices into a basic plan for living—and the Buddha’s instructions on mindfulness and compassion. Meditations on Intention and Being will provide readers with an ancient set of instructions for how to live and love well today. A set of instructions that takes the life we are living, the gifts we’ve been given, and creates happiness and freedom. Returning readers will find this book a great companion to my earlier writing, but those unfamiliar with Meditations from the Mat need no prior knowledge. I will guide you through important concepts in a clear and carefully organized manner, illustrated with many examples from my own life and the lives of friends and colleagues. Whether you are an experienced yoga practitioner or you’ve never taken a class, whether you already meditate or you’ve never tried, whether you belong to a religious organization or not, you will find in these pages guidance and practices that have the ability to effect positive change in every facet of your life. Beneath our feet lies an infinity of paths.The power of mountain pose is that how we stand in it defines the path we will take and the sort of traveler we will be. The mind attempts to create a certainty about our travels, but there is none. Each time we find our mountain we choose our path forward. Each time we find our mountain we choose what kind of traveler we will be. And we cannot choose for tomorrow; we can choose only for this moment, this body, this breath. My neighbor lost his house this year. He is a contractor and just did not get enough work. I did not know of his troubles until I came home to find him moving out. There was enough ambiguity around what was happening that I could have gone into my house and avoided an unpleasant situation. My wife was with me, and as she was getting out of the car, I paused. My first spiritual community was a twelve-step program, and it saves lives by not being afraid of other people’s pain. I reflected. My yoga community is informed by the principles of loving-kindness and compassion, which guide us as we work with other people’s pain. I understood. My years as a counselor and as a yoga teacher have taught me that people are afraid of being rejected for being imperfect, for having pain. I acted. I told my wife I would be inside in a minute and got out of the car. I walked over to where my neighbor was moving his belongings out of the house he had hoped to raise his children in, content to say, “Thank you for being my neighbor,” to share his pain, and to say goodbye. Rolf Gates, author of the acclaimed book on yogic philosophy, Meditations on the Mat: Daily Reflections on the Path of Yoga, is one of the leading voices of modern yoga. A former social worker and US Airborne Ranger who has practiced meditation for the last twenty years, Rolf brings his eclectic background to his practice and his teachings. Rolf and his work have now been featured in numerous magazines, including Yoga Journal, Natural Health, and People Magazine. He is the co-founder of the Yoga + Recovery Conference at the Esalen Institute in Big Sur, CA and brought Yoga and Foundational Stretching to the US Department of Defenses’ Tri-County Summit on Sustainability. He is pleased to be working with the US Military on sustainable care for the troops and their families.